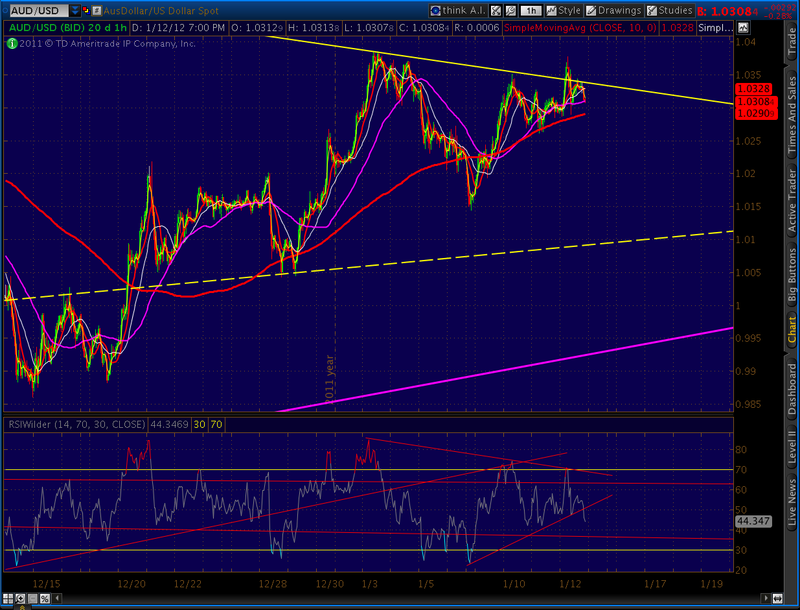 Just noticed that AUDUSD just broke its RSI trend line on the 60-min chart. And, the daily chart shows quite well how the latest rise was most likely just a back test of the recently broken 200 SMA — indicated in red on the second chart below. The AUDUSD has been a very reliable indicator of equity price direction. Check out the long term chart, then how it matches up to SPX. The fan line that cuts through Oct 4 makes for a nice neckline, no? In my opinion, it’s got a day or two at most before its next tumble. Friday the 13th anyone? 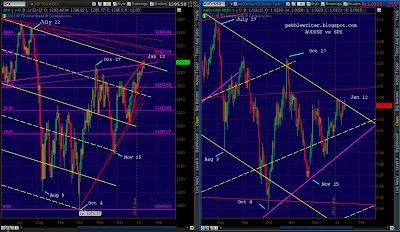 BTW, the very knowledgeable Mitchkeller over at the excellent YAEWAB has a great chart detailing the divergence. In short, it’s extreme. Fine piece of writing from Charles Hugh Smith. Read the rest at Of Two Minds. Another day watching the paint dry on this market. Although an interesting little tidbit concerning the VIX… In addition to an apparent break out of the falling wedge (and back test), I see a very small inverse H&S; pattern developing on the hourly chart, indicating a nominal upside to 24 or so. It’ll take a close at 22 to complete the pattern. Of course, a close at 24 would portend a larger pattern to 28, which would lead to 40, etc. etc. In Wall Street’s version of “If You Give a Mouse a Cookie,” there’s the very real possibility that this is only the first of the many more cracks in the dike to come. We saw the same pattern get the July drop going. Although, it took about three generations before it produced soaring VIX values. 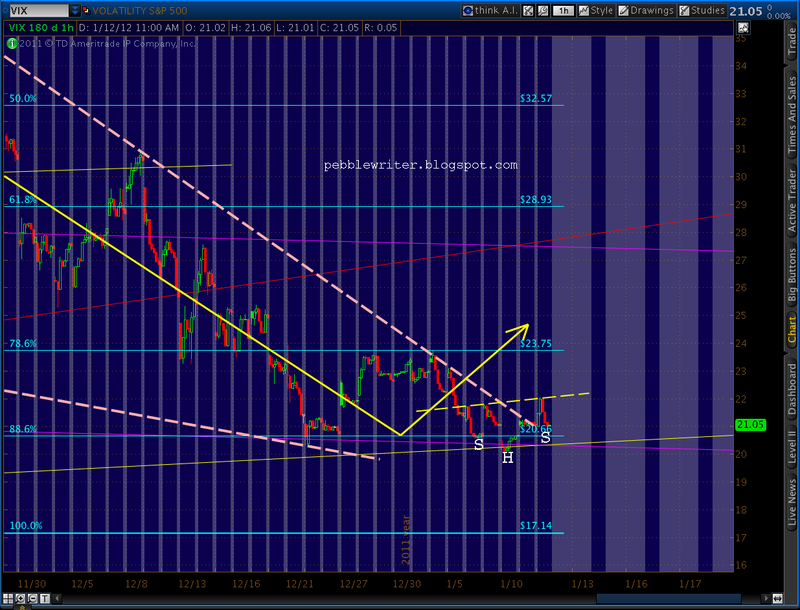 Something to keep an eye on, especially if the back test holds. There’s a similar back test occurring on SPX, although that particular rising wedge has expanded three separate times, tossing lower bound touches aside like used Kleenex. Perhaps, as we’re positioned a mere 12 points below our secondary 1307 target and nudging the psychologically important 1300 level, we’ll see a decisive break one way or the other. Yesterday, XLF tagged the .886 of an apparent Bat pattern and is now reversing. 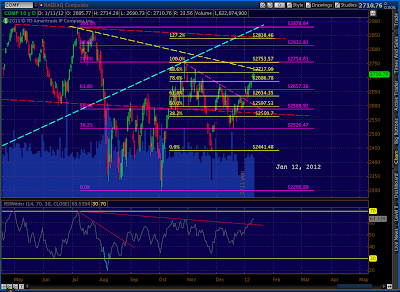 Recall that its Point B slightly exceeded the .618 Fib that’s the limit for both Gartleys and Bats. 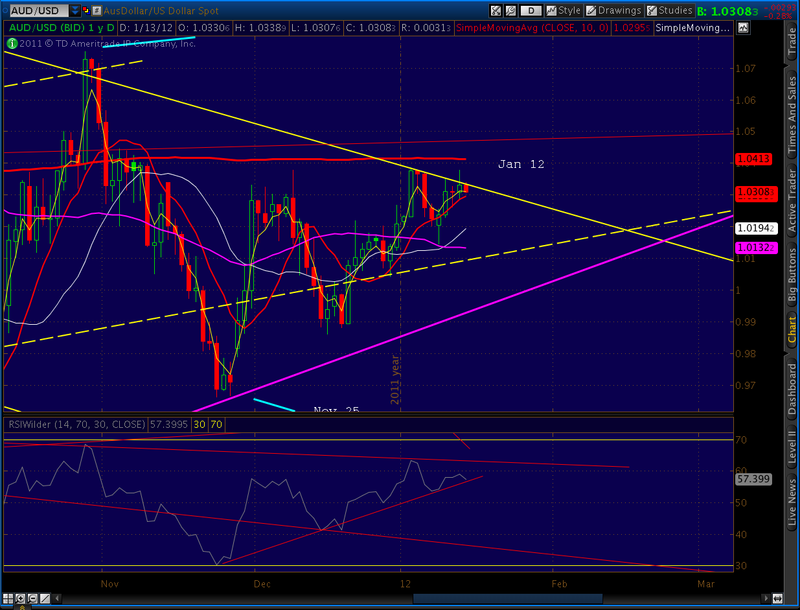 But, we had a trend line off the Feb highs that argued for a reversal at the .786 at 13.65. 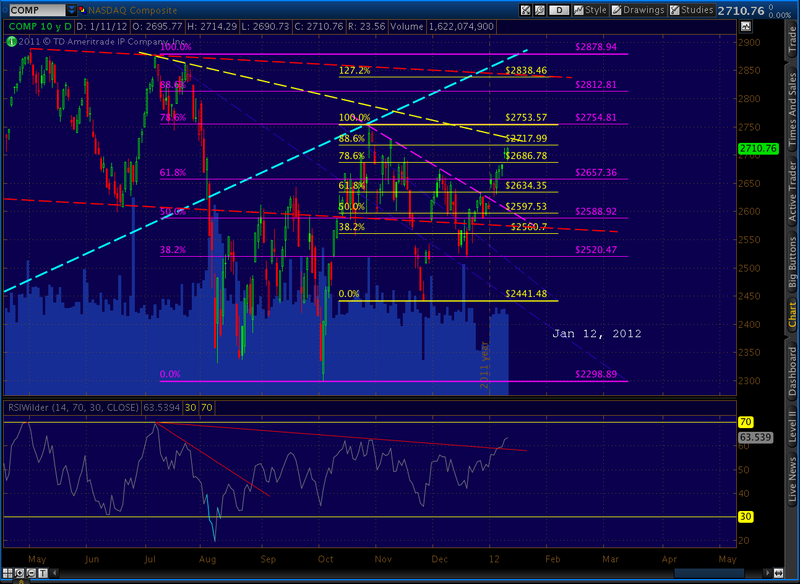 The rise of the past two days tagged the .886 of 13.89, slightly shifting the TL off the top to exclude the July 7 high. It’s not quite as good a fit as the other, but it’s still legitimate. 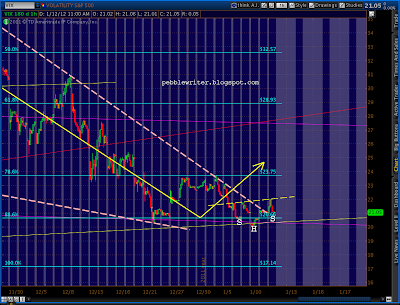 Trend lines don’t have to include every relevant point. Occasionally, whether through excessive exuberance or good old market maker manipulation, the boundary gets pushed. It’s a way of clearing out shorts and puts, who set stops at price levels representing important resistance. A hallmark of this market over the past year has been the ramping up of prices in the futures markets overnight. For relatively little cost, market makers can create a gap up at the opening of the cash market that, more often than not, carries through into the day. It’s a manipulation, of course, that always works — until it doesn’t. When a market is stretched beyond what the underlying fundamentals and economic backdrop support, it has the tendency to snap back violently. All it typically takes is a catalyst: downgrade, default, ugly employment or earnings report, war, oil shock, etc. Wave 2’s do not want to be wave 2’s, no matter what the size. Part of wave 2’s personality is that they wish to be true bull waves. And true bull waves do not retrace partially – they make multi-year market highs. This one has been very strong. It’s made believers of many former bears — witness the record low bearish sentiment among small investors. But, it will fail — and soon. And, yes, financials — which are largely responsible for the excesses that led to the financial crisis in the first place — will lead the way. 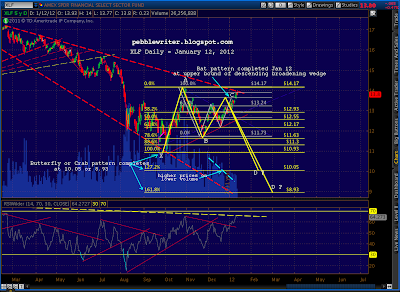 COMP has completed a Bat pattern that hints at a possible extension to a Butterfly at 2838. The first pattern, a Gartley, completed at the .786 (on the purple grid) on Oct 27 at 2753. Since then, however, another pattern (in yellow) has emerged — with a Point B at the .786 and currently approaching the .886 at 2718. 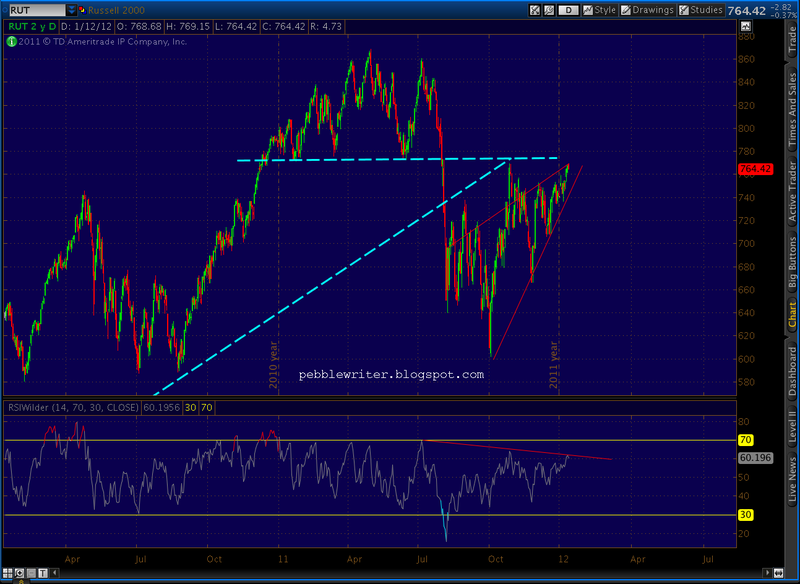 At that level, it lines up nicely with a trend line off the July highs and signals an impending reversal. The only issue that gives me pause is the RSI, which indicates slight positive divergence and has broken through the TL that ran through the Oct high. If we give it the benefit of the doubt, it’s not hard to imagine the current pattern extending out to form a Butterfly at 2838 — the 1.272 Fib. 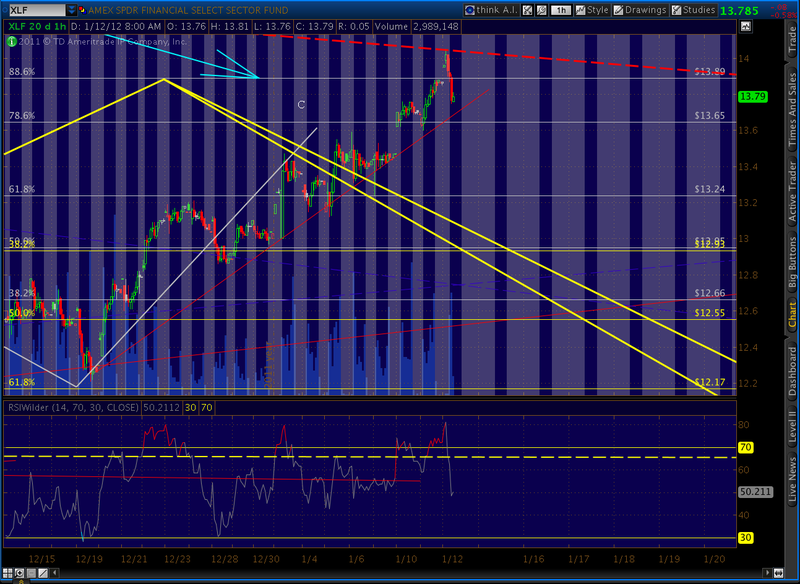 We should get a reversal here at the .886 regardless. The key will be whether we continue down — by breaking through the TL off the Oct 4 bottom (and the RSI TL) or whether we bounce off the RSI TL to make one last high at 2838. BTW, 2838 lines up very well with a trend line off the May 2 top and the July highs — the equivalent of the situation in SPX with 1307. I’d be inclined to go with this as my primary forecast — except for the fact that we have a large rising wedge and striking negative divergence on the 60 min chart. 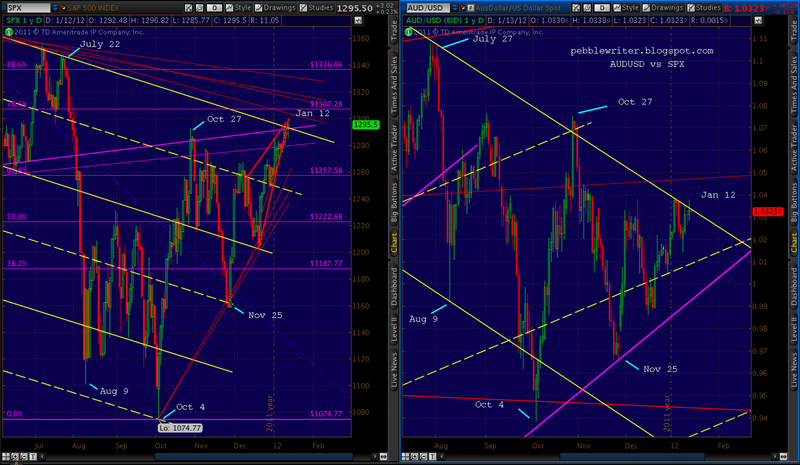 In short, the situation is very analogous to SPX. Either the market turns very soon and pays off some of these negative short and medium-term signals, or we could get a last little bump up to the TL off the May 2 highs. So, if we break through 2718 and the previous high (2753), look for a run up to 2812 (the .886 on the combined patterns) or 2838. 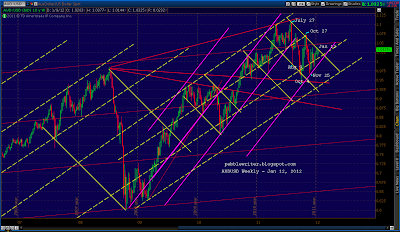 A different picture presents on the Russell 2000 (RUT). Recall that the COMP is market cap weighted, with the top 5 stocks (AAPL, MSFT, ORCL, GOOG and INTC) representing 25% of the total; the RUT’s biggest stock is only .32% of the index. This is what the broad small cap market looks like — absent the juicing going on in the ever narrower “leadership” segment. The daily chart shows very strong negative divergence and a clear touch on the “third rail” which is also the neckline for the H&S; pattern. In fact, Minor 2 looks like nothing more than a back test of that neckline and — except for the Oct spike — has traced out a very convincing rising wedge. 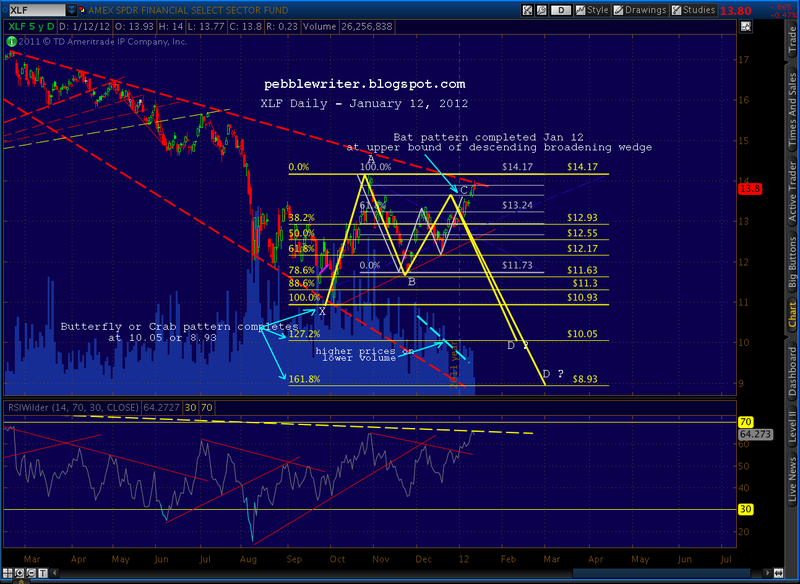 All in all, it’s a very bearish chart. Me, too. Let's all wish each other a profitable Friday the 13th. Re DX and bonds, I still see us completing the flag — at least. That means 87+ on DX. 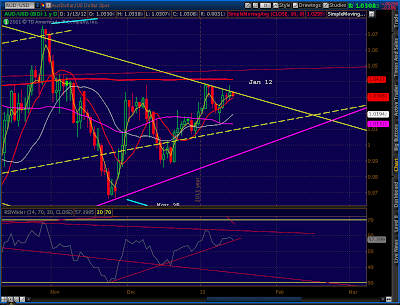 Check out the AUDUSD chart I just put up. Speaks volumes about the divergence that's being "engineered." 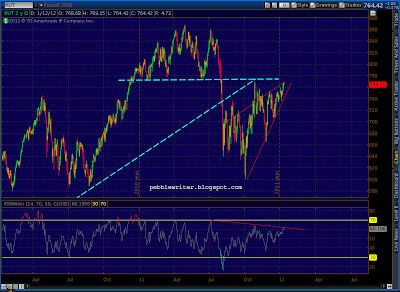 Also, RUT vs COMP. Guys, all I can say is I feel your pain. I've been saying any day now for a while. I believe TPTB know how precarious the situation is, and are digging in and doing what it takes to keep this sucker alive. The overnight ramp jobs are especially annoying. I think we're going to need a catalyst — some point of recognition, whether it's news or hitting the 1307 mark — something to get the ball rolling on volume. Once that happens, it'll fall a long ways before they can slow it down, let alone stop it. The problem, BTW, is I think there's just too much recognition that we're heading down the same path as 2007. Up until the middle of October, it was the EXACT same path. And, I think enough status quo protectors realized what a disaster that would be that the plunge protection team got together and agreed to protect their phony baloney bonuses. I think it fails sometime soon. The TL off the May high is coming to us, whether we approach it or not. I can't see the market, with increasingly narrow leadership and lower volume, getting over that hurdle. So what's going to be the outcome here? 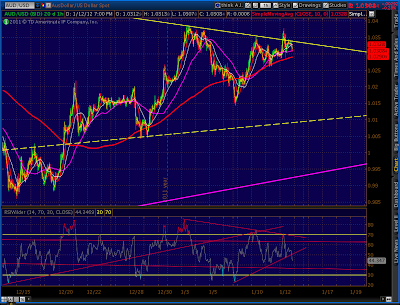 USD/bonds up, everything else down or vica versa. From where I sit things look very amgibuous in everthing. All the top callers have to be right eventually but at what level? The market could in theory just keep grinding higher for weeks. Would you like to exchange links? I have added your site to mine. I remember last July when we hit 1370 everyone including their grandma was expecting 1400. 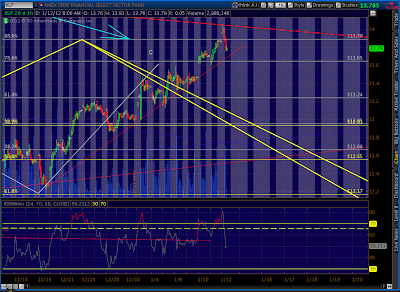 I have no idea where this top is or whether we will top but it seems everyone is making a sure bet on 1300 at least. 1301-1310 holds it back into next week…………if the dip is weak then we will see 1400-1450 by April.